Stream trout (Salmo trutta) caught in the North FÃÂ±rat Population in Erzurum province in July 2008 (2008 July-2009 March), were taken for adaptation in fiberglass tanks (1.1 x 1.1 x 0.6 m). During this period, the average water temperature was measured as 12.8 º C (max. 18.5 º C, min. 8.0 º C). After one week of acclimation without feeding, the fish fed different feeds (tubifeks dried, granules of foie gras, commercial feed extruder). Some of the fish started to take feed after forty five days. After sixty days all fish started to feed. At the same time, the feeding strategies of the fish were monitored by VCR. The fish preferred to feed on the bottom only and showed less stress to handling and high turbidity. 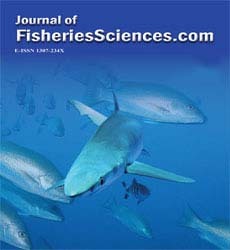 Fish lost weight during first two months, the highest weight gain was measured as 8,8 % and 10,6 % in 2009 January and 2009 March, respectively. In 2008 November some fish was striped and larvae obtained. Larvae were adapted to commercial starter feed easily. Only seven pieces of fish died due to stress caused by environmental conditions such as water cutting parasite infestation and, in the rest of the work there has not been any loss of fish. At the end of study of these fish, comparison to other natural trout promised that this trout can be cultured.